Boasting built-in ultra responsive Romer-G mechanical switches, a braided and detachable Micro-USB cable for convenience, and a compact “tenkeyless” design, the Logitech G Pro Gaming Keyboard is engineered from the ground up to deliver pro gamer caliber performance and reliability. Whether you’re an eSports athlete competing for big prize pools or just a gamer who takes their multiplayer performance seriously, there’s no better addition to your gaming arsenal than the Pro Gaming Keyboard. 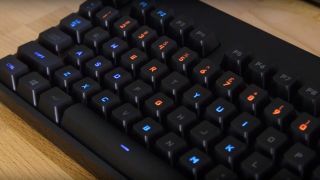 Watch the video above for a look at the benefits of gaming on Logitech’s elite mechanical keyboard—and then visit the official Logitech G Pro Gaming Keyboard page to learn more.